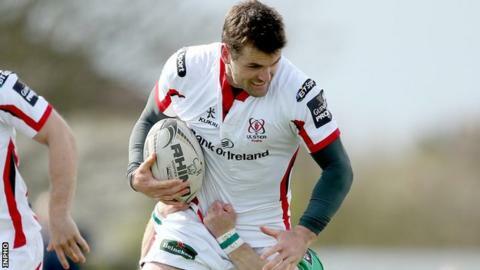 Jared Payne is in line for a possible starting berth in Ulster's European Champions Cup team to face Saracens on Saturday on his return from injury. Payne is likely to be back in action at Allianz Park after suffering a broken foot in Ireland's World Cup pool victory over Romania in September. The 30-year-old could play at full-back as regular number 15 Louis Ludik is struggling to overcome a groin injury. Payne was added to Ulster's squad for the competition last week. The anticipated comeback of the Irish-qualified Kiwi will also come as a boost to Ireland coach Joe Schmidt, with the start of the Six Nations just three weeks away. Payne played in Ireland's opening two games at the World Cup and scored a try on his tournament debut against Canada. After sustaining his foot injury against Romania, he was ruled out of the side which went on to defeat France the day before the game. Centre Darren Cave has recovered from a shoulder injury suffered at the start of December and could occupy a place on the replacements' bench as the Ulster coaching team are likely to retain Luke Marshall and Stuart McCloskey in midfield. Lock Alan O'Connor and prop Wiehahn Herbst, who missed last week's dramatic win over Oyonnax, are expected to return, along with winger Andrew Trimble, who was rested. Number eight Nick Williams is likely to miss the match after suffering a blow to the head late in the game in France. The 32-year-old is being assessed under the normal concussion protocols but the expectation is he will miss the Pool 1 contest. Ulster retain hope of qualification for the quarter-finals, with the weekend trip to the Premiership leaders and a home game against Oyonnax on 23 January still to come. The Irish province's long-term injuries include Iain Henderson, Tommy Bowe and Peter Nelson. Centre Stuart Olding is nearing a return to fitness after being out since March because of a knee injury while another Ireland player, Dan Tuohy, is expected to be available again next month after breaking a leg in early December.